A rugged aluminum sailing yacht for high latitude expeditions. Featuring a lifting keel and rudder. Hamish Laird and his wife Kate had been running sailing expeditions to Antarctica aboard Skip Novak's Pelagic for several years when they decided to have a boat of their own purpose-built for sailing the rough waters and exploring the harsh but beautiful landscapes at the bottom of the world. Hamish and Kate came to the office with a long list of requirements that long experience had shown them would be necessary for a successful expedition charter yacht. Chief among these were a fully retractable keel and rudder for exploring often uncharted areas. The aluminum construction is necessarily robust and much of the ballast is internal. Since stability is provided by mass instead of draft, Seal has a comfortable motion that is appreciated in the frequent rough conditions in which she sails. Machinery is kept simple for ease of maintenance in remote areas. The engine is a bullet proof naturally aspirated six-cylinder Cummins. Warmth is provided by a reliable Refleks heater. With an endless supply of glacial fresh water in the cruising area, there is no need for a watermaker. The deck layout features a small cockpit. Halyards are not led all the way aft because lead blocks are often frozen. 50 knot winds are a frequent occurrence, so a fourth mainsail reef is used in lieu of a storm trysail. Common living areas are located in the spacious pilothouse. Since the cold polar air makes dining in the cockpit uncomfortable, and having the saloon below denies charter guests the spectacular views that are the very reason they took their trip; the main saloon and dining area are located up in the pilothouse where the scenery as well as the food can be enjoyed in warmth. Also sharing the space is the galley, so the cook and crew can enjoy each other's company. Belowdecks is reserved for sleeping cabins. It is an excellent arrangement that allows crew and guests to spend every waking hour drinking in the beauty of the pristine and unique parts of the world where they travel. 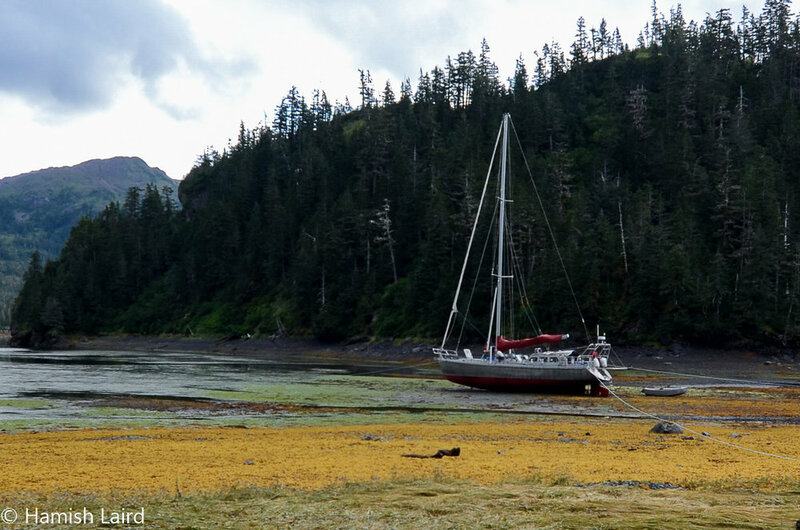 In recent years Seal and crew have been exploring the waters of Prince William Sound in Alaska. You can follow their exploits vicariously (or better yet participate in them by booking a charter) at their website and Facebook page. 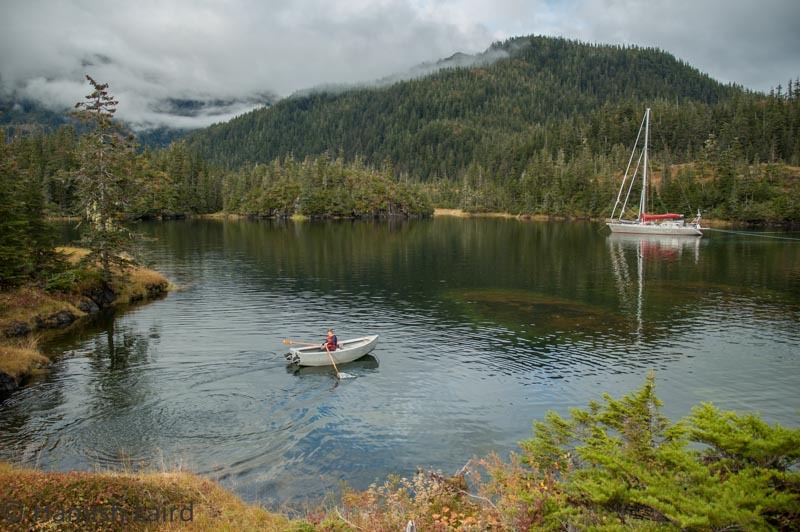 Shallow anchorage in Prince William Sound. Keel and rudder were raised to get here.